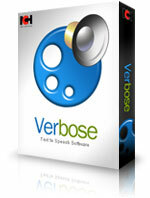 Verbose is an easy and convenient text to speech converter that can read aloud or save spoken text to mp3 files. With Verbose text reading software, you can have Verbose read the current text on your screen out loud with the simple press of a button by setting up system-wide hotkeys. Alternatively, use Verbose text to voice software to save your text documents or emails to mp3 audio files for your mobile phone, iPod or mp3 player, so you can listen to them on the go. After you've saved your spoken text to mp3 or wav, you can add further vocal effects and create a variety of character voices with Voxal Voice Changing Software.